My companies logo really stands out on these color-block trade show bags. Thank you for the great product CEP. Loved the way I was able to design these eco-friendly and reusable trade show bags. I will be a returning customer for sure in the near future. Needed to figure out a way to gain business exposure and these sure did the trick. The bags came out wonderful. I will be referring your company to friends and family. The company logo really pops out on this bag. Really impressed with how the bags turned out and just this company as a whole. Will be a repeating customer. Awesome company to do business with. Eco-friendly and custom made products for affordable prices. Don't miss out on the Custom Earth Promos page. I wanted a creative way to gain exposure within the events I attend. I called Custom Earth Promos and they gave me the idea to place my logo on these trade show bags and hand them out. It has increased my business for sure. I just placed another order for 3,000 more bags. Loved these bags the color scheme was perfect for my brand! Thank you CEP! Cant wait to order more! My bags came out amazing the logo really pops. Great options on this trade show bag. Very impressed with the way my company logo looked on the front. It was distinct and stood out amongst other bags at the venue. Just received my order of 7,500 recyclable trade show bags. My company brand really stood out. Ive gotten so many compliments. Thanks. Such a trendy bag that really increased my marketing ability within the field I'm in. Its an added bonus that they are earth-friendly. I needed a product to gain me exposure at the many expose' I attend. I custom designed my own tradeshow bags and it was the best decision I could have made. Dealing with companies can be very frustrating at times, especially when dealing with so many units. I needed to place an order of over 10k trade show bags and Custom Earth Promos made the process seamless. I look forward to doing more business in the near future. Placed an order of 5,500 custom design tradeshow bags, unfortunately a day after I put my order in I had to change the color. I spoke to Cory and he changed the order immediately and I got exactly what I needed. Im convinced that you can get a eco-friendly, stylish, durable bag after dealing with this company. Classy, earth-friendly tradeshow bags that promoted my firm. 10,000 bags in a 3 week time frame is no short order. Thanks to the fine people at Custom Earth Promos they were able to get the job done. It was imperative that I received a bulk order of 12,500 trade show bags within a three week time frame. Custom Earth Promos handled the order with ease. I received my merchandise on time and couldn't be more happier. Such a pleasure doing business with you guys. Made my experience so comfortable. My eco-friendly trade show bags were great. Superior quality and timely delivery on my customized trade show bags. Loving that they are earth-friendly as well. With the use of wholesale reusable color block bags to aid your promotional, advertising and marketing efforts, you’ll be simultaneously benefiting your brand in multiple ways. 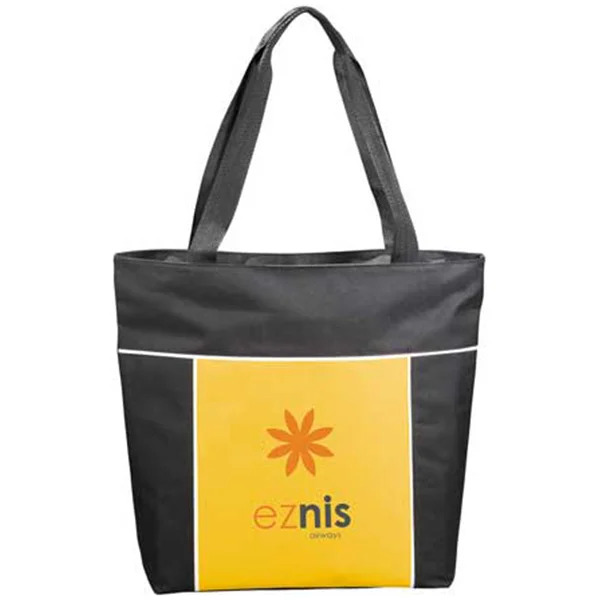 Increase the exposure and awareness of your business simply by using these versatile custom totes as giveaways to strategic industry connections, loyal customers and as gift bags for advertising events. Add the great value of eco-responsibility to your brand image by utilizing this eco-friendly product to support your next promotion, sweepstakes or as a networking aid at your next corporate convention or industry trade show. 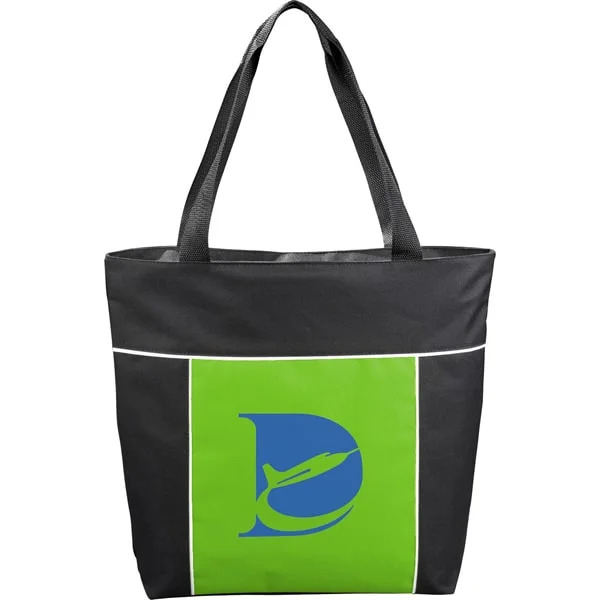 Ultimately convenient, Reusable Color Block Trade Show Bags provide wearers with the confidence of knowing their items are secure when in transit thanks to the zipper closure main compartment and extra-long 23" straps for comfortable and convenient carrying. Thanks to strategic placement and a design created for optimized exposure, the 7" W x 7" H imprint area is guaranteed to build buzz for your brand everywhere the bags are carried. An additional and equally beneficial aspect of using these color block trade show bags lies in the fact that they are reusable and environmentally friendly. By promoting your brand with these bags, you’re inevitably investing in the honorable image of your brand. Customers and prospects will admire that you are taking action for environmental preservation and be motivated to join you in the eco-conscious mission. Appealing to the human desire of being aligned with a brand that is proactive in their efforts of environmental conservation, using these bags to promote your business will also do wonders for your brand image! 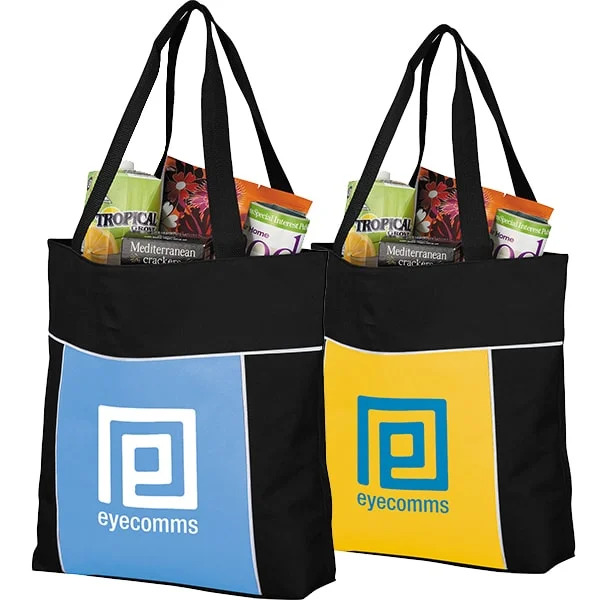 A spectacular alternative to wasteful plastic bags, Custom Earth Promos’ Reusable Color-Block Trade Show Bags have a casual charm that will garner attention everywhere they happen to travel. Choose from Black, Light Blue, Lime Green, Purple, Royal Blue, Red, or Yellow color combinations to best accentuate your chosen imprinted logo or custom graphic. Shake things up by mixing and matching the colors in your order, choosing multiple hues that accentuate your logo and complement your custom imprint. Apart from the obvious promotional push that these bags give your brand in areas of exposure, increased awareness, recognition and even enhanced brand image, it also gives you the confidence and pride of knowing that you have done your part to aid in the conservation of our planet. Distributing them to your customers and encouraging the use of eco-friendly bags is an effective way of establishing yourself as an environmentally-conscious brand. All Custom Earth Promos products are certified safe and without harmful pollutants, in line with the California's Proposition 65 regulations. When you place your order for reusable bags, take pride in the fact that you have guaranteed the safety of both your customers and the environment! When you place a direct order from overseas for your Reusable Color-Block Trade Show Bags order, we are able to fulfill your exclusive custom bag design at an incredibly budget-friendly price. At Custom Earth Promos, we take immense pride in the way we provide customer care, attention, and dedication to each and every order. When catering to the needs of various businesses, each with their own creative ideals and image, promotional products like reusable trade show bags give us the freedom to meet almost any design desire our customers share with us. We can alter the dimensions of the bag, customize fabric, fabric colors, material density, utilize various imprint techniques and so much more. You’ll work directly with our in-house design experts to define the perfect blueprint for your custom bag design. Once we’ve received a confirmation from you upon reviewing the virtual product preview or physical sample, the manufacturing process will be underway and you’ll have a powerful promotional tool at your side in just a few short weeks!